The Sierra Mist comedy team, the Mist Takes, feature in three new TV advertisements shown during the SuperBowl XLI, 2007. 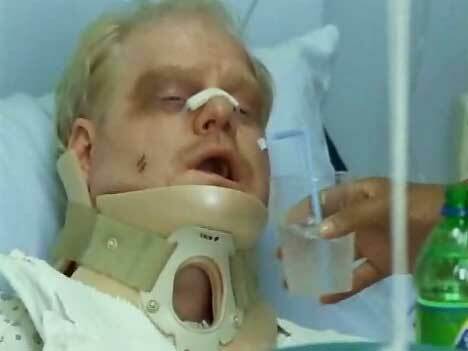 Three commercials, “Karate”, “Combover” and “Hospital Beds” provide a comic approach to the drink. 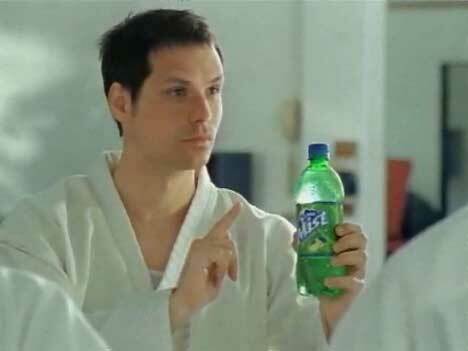 Michael Ian Black plays the black belt leader of a karate class. Jim Gaffigan plays the part of a novice martial artist. Also in the class are Nicole Johnson, Eliza Coupe, Tracey Morgan and Guillermo Diaz. Black: OK. Someone tries to take your Sierra Mist. What do you do? Gaffigan: Ask him to grab your wrist. Johnson: Pull their shoulders out of their sockets. Black: Can you be more specific? Coupe: Smash them in the face with a lamp? Black: People – your Sierra Mist looks icy cold and refreshing to those bad guys and when they reach forward what do you do? Black: Are you registered for this class? Black: Hey Ted I’m going to have to let you go. Gaffigan: It’s the beard combover isn’t it. Black: Yeah – it really makes it hard to trust your decision-making ability. Did I tell you Barbara said to me? She told me I needed to shave my moustache! Yes! I mean in front of everybody like I don’t have any feelings or something. So I told her, you know what, I don’t like your synthetic hair! It’ll catch fire and endanger the patients. OK. So she needs to quit with it…. (she takes a sip for herself) This is pretty good! I love that Sierra Mist! Just take this bottle. He don’t want it. The Sierra Mist campaign was developed at BBDO, New York, by chief creative officer David Lubars, chief creative officer/copywriter Bill Bruce, art director Doris Cassar, executive producer Hyatt Choate, senior producer Amy Wertheimer, and executive music producer Loren Parkins. Filming was directed by Hank Perlman via Hungry Man, New York, with director of photography Joe DiSalvo. Editor was Tom Muldoon at Nomad Editing Company. Visual and special effects were developed at The Mill, New York. Original music was written by Alexander Lasarenko at Tonal Sound. Production company Dogmatic is looking after distribution of the Sierra Mist spots and hosts Sierra Mist Karate and Hospital in Windows Media and Quicktime formats.